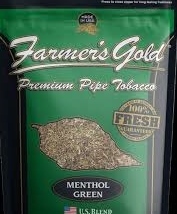 Farmers Gold Premium Pipe Tobaccos are the highest quality at the most affordable prices. This Tobacco goes through an extra screening process to eliminate most stems and shake. Farmer's Gold Pipe Tobacco is manufactured in North Carolina right in the heart of tobacco country!